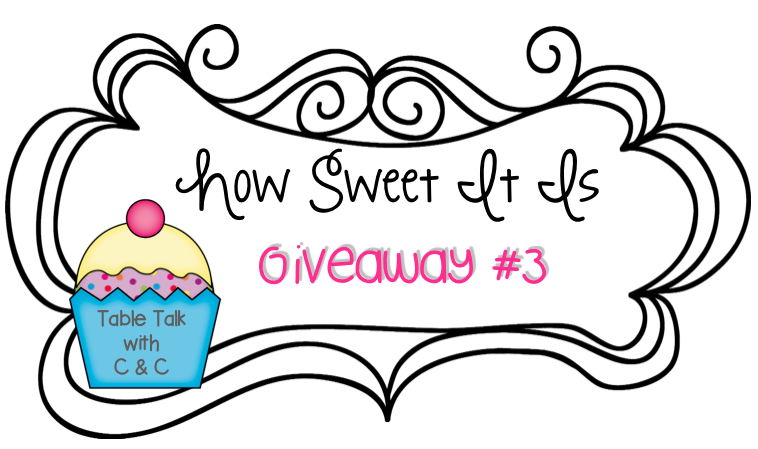 Table Talk with C and C: How Sweet It Is To Have A Giveaway!!! 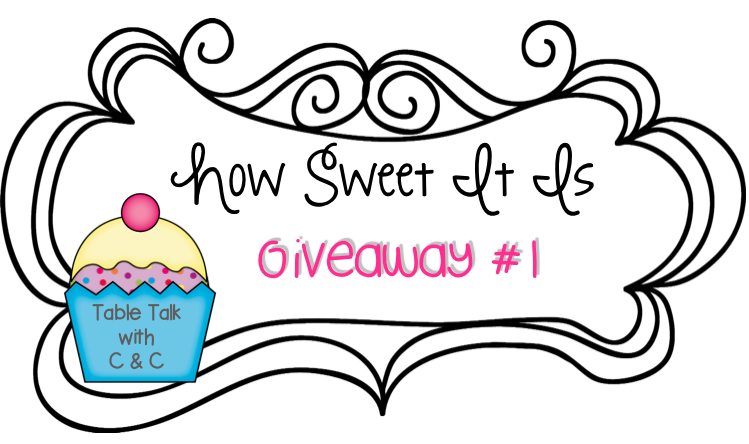 How Sweet It Is To Have A Giveaway!!! We recently achieved a major milestone for our little ol' blog . . . . over 1,000 followers on Instagram!! A-MAZING!!!! 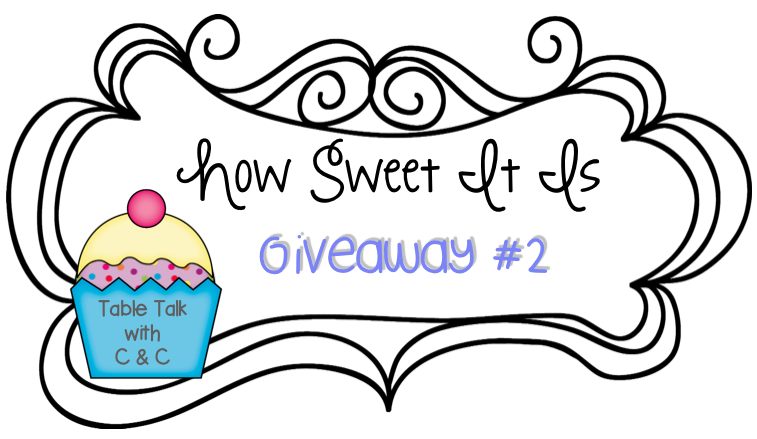 So that means it's giveaway time!!! 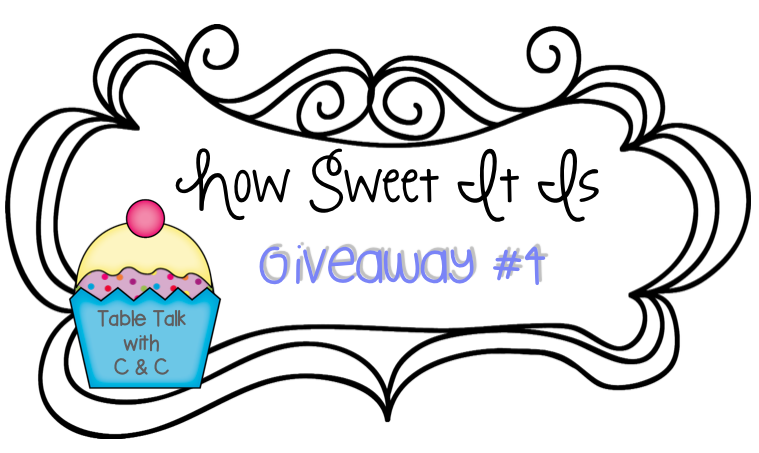 Who doesn't love a good giveaway? Well, you are in luck! 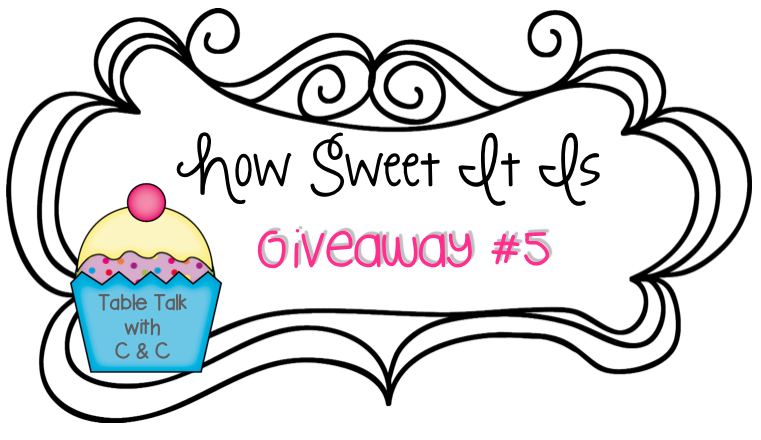 We are having FIVE (yes I said 5) giveaways!! I am overwhelmed by the generosity of our blogging/IG friends and am super excited to share these fabulous products with you all!! Click on each picture or the caption below it to see what each item is. Now onto the next one . . . But, wait . . . . there's more!! Schroeder Shenanigans in 2nd - Lights, Camera, Adjectives and Adverbs! Oh we aren't done yet! There's more . . .
Be sure to check back next week to see if you are one of our lucky winners!! We are so lucky to have so many a-mazing followers!!! My favorite end of the year activity is our Fairy Tale Ball. We will use that as our end of the year literacy celebration! That sounds like so much fun! We studied Fairy Tales earlier this year, so I will keep that in mind for next year! I am looking forward to going on vacation this summer! I am looking forward to spending time with my new grand-daughter! There were not enough hours to spend with her while teaching! I am looking for end of the year activities and beginning of the year things to make this summer. I would like to see a blog on how to keep students engaged the last 2 weeks of school. That's a great idea! We will have to work on that! I always teach life cycles and map skills. I love to have a picnic with my kiddos! I am really looking forward to spending time with my children. A trip to the beach and some time with my parents as well. A trip to the beach sounds so relaxing right now! I wish we lived closer to the beach. I am looking forward to sleeping in this summer!! My favorite end of year activity is field day!!! The topics I love to teach throughout the year include fairy tales and weather. What I am looking forward to reading on the blog is anything about close reading and it is what I am looking for on TPT as well. I am looking forward to no alarm clock this summer too!! I'm not a morning person :) Close reading is something we are learning more about as well, so that would make a great blog post! Thanks! I'm looking forward to going back to Asia during the summer holidays to visit my family and friends! That sounds like an amazing trip! Enjoy! Me too! Enjoy your time with family!! I am looking forward to sleeping. I am looking forward to reading several books this summer! 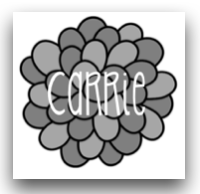 I am looking for summer products on TPT right now! I would love to see end of the year activities! I love creating memory books at the end of the year! So do I!! That's one of my favorite activities to do with our students and they love it!! I love having special days for my parents: Munchies for Moms and Doughnuts for Dads. The kids and parents love it as well! I am looking forward to no summer school teaching this year and having June off this year. I look for Kindergarten ELA products on TPT. I would like to see classroom management ideas. I teach five senses, butterflies, living and non-living. My favorite activity is having the kindergarten end of the year celebration with the parents. I am looking forward to a relaxing vacation. I like our field day and going on a field trip. I am looking for products for science such as force and motion or matter. I teach topics related to the Common Core. As an end of the year activity, I love to do letters to next year's kids about what to expect/do. They are always so fun to read and of course to pass on. I am looking forward to sleeping in and getting fresh sunshine. My favorite end of the year activity is the memory books. I am looking for word family activities on TPT. I also would love to see ideas on using the common core in resources. Topics I teach each year include: transportation, community helpers, living and nonliving things, holidays, animals/where they live, five senses, maps, changes in matter........and on and on.. I am looking forward to spending time with my son. I am always looking for interactive notebooks and novel studies. Every year I like to teach about butterflies, frogs, apples, ants, weather, the solar system etc. It depends on the students and what their interests are...some classes share different interests so it all depends on my students.